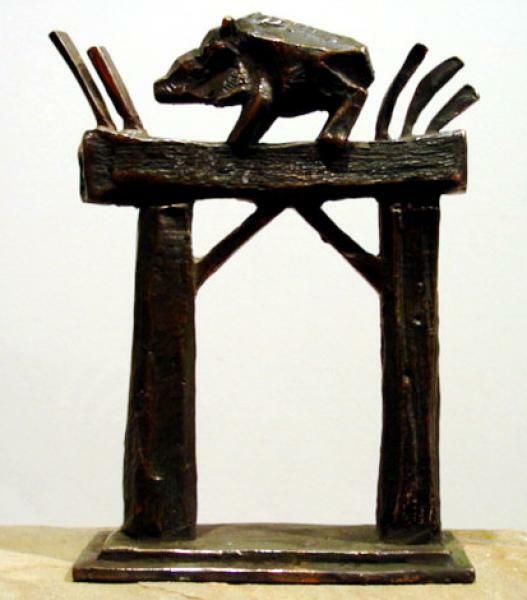 A gateway with crossed beams and supports with a boar on top of it. This sculpture was the premise for the large-scale wooden arch created by Dmitry and his son Daniil in Wales (GB) and was included in the 2002 GVSU exhibition titled "Minimonumentalizm." The themes and inspiration for this arch design came from both Japanese and Roman cultures with local mythological symbols added in.